If you are concerned about your own drug or alcohol use, go to www.checkyourself.org. For more information on Drugs and addiction and for advice on how to talk to your friends about their drug and alcohol use, go to www.freevibe.com. For science-based facts about how drugs affect the brain and body, go to www.teens.drugabuse.gov. For more information or to talk to a specialist who can refer your friend to help, call 1-800-788-2800 or go to www.health.org. For information about underage drinking and alcohol problems, go to www.thecoolspot.gov. 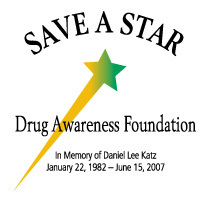 For more information, contact SAVE A STAR Drug Awareness Foundation at 847-579-1300, or click here to contact us via email. Are you concerned that a friend or a family member has a drug or alcohol problem? Signs of substance abuse may include depression, erratic behavior, sudden changes in personality, or problems with their health, or behavior at at work or school. Accident or DWIs may also be involved. substance use. You may also feel scared, angry, hurt, confused, or depressed. You, too, may feel very alone. Are you struggling with an alcohol or drug problem? Do you feel alone, depressed, sad and isolated from others? Do you feel fearful or filled with guilt? Are you feeling ashamed about your behavior? Or have you lied to the people you care for? Struggling in school or at work? Yes, these are some of the results of drug addiction, and you may even know this, but you continue to use anyway—even in the face of the consequences. But down deep, you want to be free...clean ...happy, but you know you need help but struggle to kick the habit. Many people, just like you, struggle with these same problems. You are not alone. Millions of people struggle with alcohol, pills and illegal drug addiction Millions have confronted a friend or a loved one in an effort to help. rug dependence and substance abuse problems are everywhere, in every community across the U.S. And drugs do not discriminate. They grab hold of the lives of rich and poor, young and old, black and white. It is a disease that impacts every all walk of life. The good news is, anyone can recover with help. And the stories of recovery are many and heartwarming, with individuals discovering a new identity and a better, more fulfilled life surrounded by loved ones. And it all begins the same way: asking for help. If you think no one can help you, or you believe that you and your family must suffer alone, you are wrong. There are many who care and can help you with your (or someone else's) substance problem or addiction. Begin with your doctor: Chances are he/she knows you, your health history and your needs, and may be helpful in treatment. Your physician also can provide recommendations for a counselor, a treatment center or another medical professional. Contact a counselor: You may consider a social worker, a psychiatrist, a mental health counselor, plus there are numerous substance abuse professionals who you can interview. You should discover someone you trust and that you can confide in. Always review their qualifications, certification and experience. Always check with your insurance provider to review your coverage. Many clergy, rabbis and religious educators have counseling skills or may be able to suggest someone who can help you. Employers often have professionals on staff who help employees, their families and dependents when it comes to drug or alcohol issues and require treatment. Al-Anon and other similar support groups also help families and friends of people with alcohol and drug problems, and these programs often prove very effective.